6 Stories from the 7 Continents: End game approaches in Syria? While the Western world's attention (and mine) is focused on the Boston Marathon bombing early this week (of which the Chechnya angle will be looked at in my next post), more ominous developments occurred regarding the ongoing Syrian civil war. The UN estimates the death toll now stands at 70,000 as of late February and accelerating, with over 10,000 killed in that first 7 week period of this year alone. From a recent February Reuters article, "Syria is self-destructing," U.N. Secretary-General Ban Ki-moon told the Council on Foreign Relations on Monday. "After nearly two years, we no longer count days in hours, but in bodies. Another day, another 100, 200, 300 dead." "Fighting rages. Sectarian hatred is on the rise. The catalogue of war crimes is mounting," he said. "The Security Council must no longer stand on the sidelines, deadlocked, silently witnessing the slaughter." Aleppo, Syria's 2nd largest city, is slowly being pummeled into a vast wasteland of concrete and rebar. "The lack of consensus on Syria and the resulting inaction has been disastrous and civilians on all sides have paid the price," said [Navi Pillay, the U.N. high commissioner for human rights]. "We will be judged against the tragedy that has unfolded before our eyes." World powers are divided on how to stop the escalating violence in Syria ... Permanent Security Council members Russia and China have acted as Syria's protector on the council by repeatedly blocking Western efforts to take stronger U.N. action - such as sanctions - against the Syrian government to try to end the war. Both sides to the Syrian conflict have been accused of committing atrocities but the United Nations says the government and its allies have been more culpable." Besides the appalling death toll, over 1 million Syrians have become either refugees (primarily across the borders into Turkey and Jordan but also to Lebanon, Iraq and Egypt) or are internally displaced. The basic infrastructure of the country - water,sewer and roads - are being demolished, as well as a variety of culturally significant structures and sites. Refugee camps in both Jordan and Turkey are overloaded, but nonetheless better by far than more informal and rudimentary conditions of those Syrians displaced within the country itself. Western sources, as well as factions within the Syrian opposition were dismayed by the announcement of one of the larger rebel factions that it was formally aligning itself with al-Qaeda. 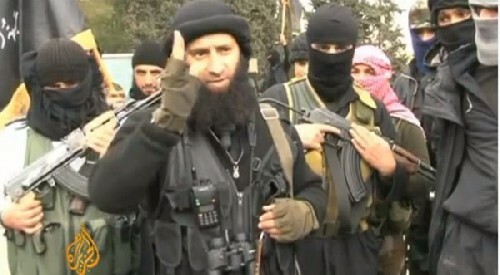 "The sons of Al-Nusra Front pledge allegiance to Sheikh Ayman al-Zawahiri," Abu Mohammed al-Jawlani said in a recording. From an AFP article, "A decision by the head of al-Nusra Front to pledge allegiance to Al-Qaeda chief Ayman al-Zawahiri has prompted unprecedented criticism from some of Syria’s Islamist rebel brigades. Until now, rebels had sought to bury their differences with al-Nusra, reluctant to jeopardize ties with a force that is militarily superior to most of the country’s rebel factions. But an announcement this week by Al-Qaeda in Iraq, claiming al-Nusra as part of its network, and a pledge of allegiance from al-Nusra’s chief to Zawahiri have prompted rare direct and public criticism. “When we in Syria launched our jihad (holy war) against the sectarian regime... we did not do so for the sake of any allegiance to a man here or another there,” the Syrian Islamic Liberation Front, an umbrella group of rebel brigades, said in a statement on Thursday. The announcement underscores a longstanding concern of Western allies that the Free Syria movement is increasingly infiltrated and radicalized by Islamic extremists, and ironically boosts Syrian President Assad's stance that he is fighting against Islamists. From the AP, "The Pentagon is sending about 200 soldiers from an Army headquarters unit to Jordan to assist efforts to contain violence along the Syrian border and plan for any operations needed to ensure the safety of chemical weapons in Syria, Defense Secretary Chuck Hagel told Congress Wednesday." The development ups the ante for the US which has long resisted any significant military deployment connected to the Syrian conflict. The unit sent however, is not just one of generic "soldiers" but the 1st Armored Division's contingent of planners and specialists in intelligence, logistics and operations. Training camp inside Jordan but near Syrian border, similar to where US planners are now headed in greater numbers. Little acknowledged are the presence of UK troops with similar intent. The deployment indicates the seriousness with which the US and other Western countries are viewing the creep of developments in Syria. Jordan has long resisted any significant presence of Western troops inside its country, as Jordanian islamists are sure to use the news to bolster their criticism. However, the increasing likelihood that Syria's chemical weapons arsenal will be in danger of being captured or transferred to Islamic elements has trumped those calculations. Finally, Israel, long focused on Iran's growing nuclear capability, has acted only once in the Syrian civil war, attacking a convoy of weapons apparently headed to Lebanon in late January, 2013. Its military, though, is increasingly concerned that chemical weapons as well as advanced weaponry held by Assad's government may find their way into even more extremist hands. In late January 2013, Israeli warplanes attacked a weapons convoy headed from Syria to Lebanon - details of what was targeted are not available to the "general public" and government reactions around the world were uniformly minimal - which usually signals it was a serious matter and that there is little to gain from acknowledging the action. Events seem to be moving towards an uncertain end ... sometime in the next weeks or months. Did you know that that you can make money by locking special areas of your blog / website?